Valor seals & protects travertine flooring on TNT's Dallas TV show set. Valor Janitorial has worked with TNT's new Dallas TV show all three season's. They've done work on about 20 different occasions for different scenes so far this season. Valor recently sealed and protected the expensive travertine flooring on a local Dallas TV show set. The set location and travertine flooring was at Museum Tower in downtown Dallas. The TV show was shooting a scene that would involve gunshots and fake blood. Valor's expertise was needed to protect the travertine flooring and keep it from being damaged or stained. Their knowledge and experience in floor sealing served the Museum Tower and the Dallas TV show well. They protected the floor from damage and kept it from being stained with the fake blood. 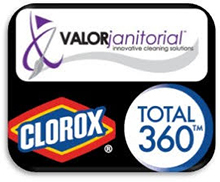 Valor Janitorial is the leading provider of tile floor cleaning and polishing services in the Dallas-Fort Worth area. Valor's many years of experience, modern equipment and best methodologies in the industry, make them the top choice for floor cleaning needs. Valor Janitorial offers commercial carpet cleaning and Floor Cleaning and Polishing in the Dallas-Fort Worth area. Contact us for a FREE estimate.